Ronald de Boar's Ajax suffered a 0-1 defeat in Ukraine last Thursday was not a surprised, as Dnipro crowds and hooligan culture had caused many big European teams shaken at their home ground. 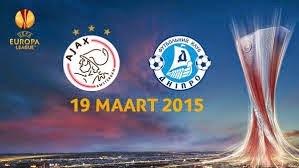 It was a fair result as Dnipro only won 1-0, and this 2nd leg is wide open! Ajax lost their last 16th round last season in the Europa League to Salzburg and surely Ronald de Boar will not want to see the same result again, Ajax simply no choice but to score a goal! Dnipro had only won once in their last 8 away Europa League games, that's was at Qarabag by 2-1, hardly impressive! I really can't see they beat Ajax in Amsterdam tonight, this game could well be going into extra time, I am backing a home win tonight!